This refers to the application of termiticide emulsion during the construction stages of a building starting from the foundation footings and the outside perimeter and covers all the soil, forming a complete barrier. This treatment depends both on the way a structure is going to be built as well as the structural composition of the building and is more effective method in controlling the termites. The chemical barriers must be continuous under the whole of the structure of the new building to be effective. The entire foundation must be surrounded and in contact with the insecticide-treated layer of soil. These chemical barriers are usually laid after completing all site works of leveling, excavation, filling, and compaction and also after installing underground electrical conduits and plumbing pipes. It is best done before laying the floors of building with suspended floors or immediately before placement of waterproofing membranes for buildings with concrete floors. This type of treatment is usually done by drilling and injection under the existing buildings to create a continuous chemical barrier that will block all possible termite entry. The main entry points of termites are foundation expansion joints, outside perimeter wall and cracks in the flooring/foundation walls and footings of the building. 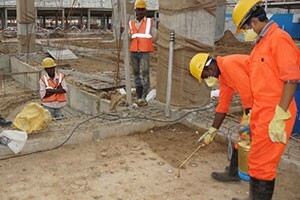 Post Construction treatment works are guaranteed for a period of 5 Years. Wood preservative or "drill-and treat" applications have been used since the 1920s to treat dry wood termite infestations which are accessible and detectable. An insecticide is injected into small holes drilled through and wood surface into termite galleries delivering the treatment directly to the pest population. This is the simplest and most direct method of treatment. When building a new home, many decisions fall upon the shoulders of the new homeowner. One critical decision that is often overlooked is the need for termite prevention. A "termite pre treatment" is an important step in homebuilding, particularly in areas of the country with high termite pressure, and can be applied by a licensed pest control professional to prevent subterranean termite damage to a home. The best time to provide protection against future termite infestation is during the planning and construction phase of building one's new home or structure. This is achieved by placing a barrier under or around the house. 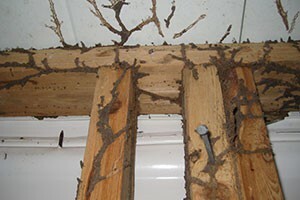 Termites play a vital role in our ecosystem. They maintain nature's balance by breaking down dead wood and other plant material. There are nearly 2,600 known termite species worldwide. However, when termites invade homes, they become major pests and cause an estimated crores of rupees in damages each year. Crores more are spent on termite prevention and treatment, making them the most economically significant wood-destroying organisms. An average home suffers thousands of rupees in damages before termites are detected and termite damage may not be covered by many homeowners' insurance. Prevention is key. It is important to have annual inspections. Early discovery provides you a head start in solving this problem.